We just got back from Los Angeles a couple of days ago. We're happy to be back at HQ, but sad to leave the fun of the West Coast. While out there, Coop and I decided to take a little trip to an area Toys'R'Us just to compare the foam section a bit. The price gouging seems to be consistent at each Toys'R'Us. 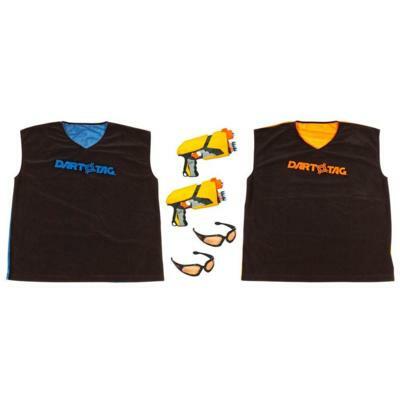 Though, unlike our local store, this one had the Dart Tag Starter pack with two training jerseys, two Sharp Shot blasters and two pair of vision gear goggles that I am tempted to call version 1.5. Speaking of melee choices, you wouldn't believe some of the coverage we have coming in the weeks ahead. While out in L.A. we had the chance to talk with David Ballard, commissioner of the Foam Weapon League. What's that? Only an awesome new alternative sport that is soon to hit airwaves and the interwebs near you! Whether you're already a fan or not, there are some cool facts you're not going to want to miss out on. Also, have you ever heard of LARP? We delve into one SoCal group that was kind enough to show us the ropes. We're really stoked about where the next episodes will be taking us! Well Warriors, today we write to you from the road. Coop and myself are just pulling in to Los Angeles in the company of our roommate (Hi, Mark). Be looking for another review in a week or so to finish up our special edition of NDTL blaster reviews! We get to do this one from a fun place on the coast! Did you notice the slide-stop/release that makes these blaster feel just a little more realistic? I've got to say that it's notable that NERF is taking a step toward a realistic feel but still trying to keep away from a dangerous LOOK out of the box. Also, the ammo looks different than a lot of people have been assuming on-line. It's not the foam disc donut that we've come to associate with Lanard's disc shooters. It still has the hollowed-out bottom, we assume to work with their spring, but the top is covered (perhaps to make stefan discs more difficult?). In fact these seem more like hardened foam like you see on some stock LARPing weapons. 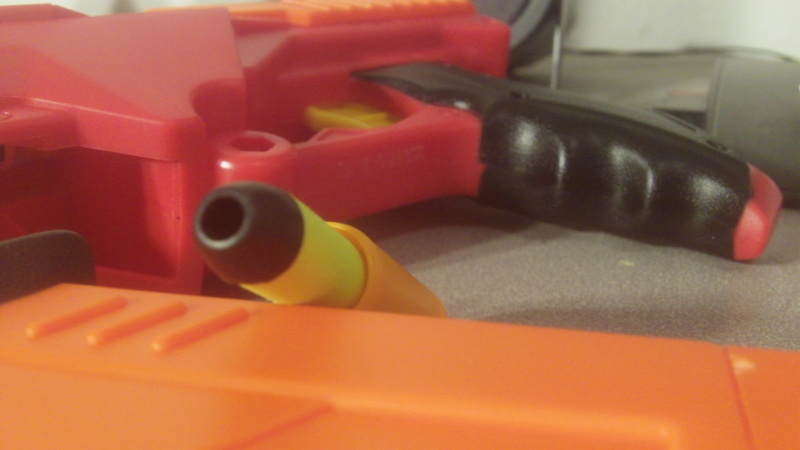 It's shiny material, but we hesitate to say plastic since NERF is always up on the safety aspects. 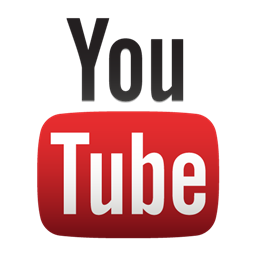 We kind of let a lot of the last video speak for itself as we're not here to steal NERF's thunder or to repeat what you can see for yourself. But if you missed something or just want to confirm what you saw, Urban Taggers has some great commentary over there. They've included some write-ups and break-downs that fans wrote for them. Well on to enjoy the West Coast for the few days we're here. Anyone have some suggestions? Throw us a comment soon. We leave in 3 days! It's been a fast-held industry standard to shy away from comparing foam dart guns to actual firearms. Though companies such as NERF edge excitingly close to replica possibilities at times, they never call their toys "guns". It's always blasters. The Hollow-Point dart shell, and clip. We decided to pick up the Air Zone Shoot 'N Shatter system at Toys'R'Us in our ever-continuing quest to find effective targeting systems to test our blasters on. 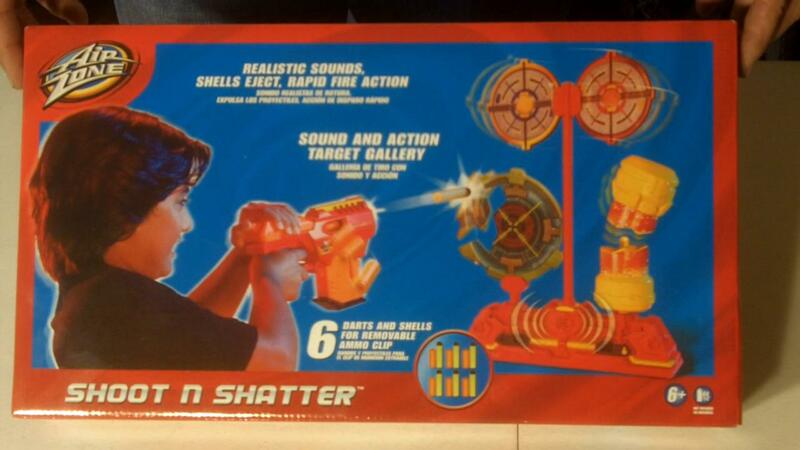 The Shoot 'N Shatter includes an electronic target set and a Shell Shock X-6 blaster with the darts, shells and a clip. Imagine our surprise, excitement and awe when we discovered what we can only call the Air Zone Hollow-Point Dart! When we un-boxed it, we weren't expecting what looked like a bullet and cartridge. We thought we had found the coolest dart ever to add to the arsenal we use for range tests. The down side is that these darts will barely fire out of anything other than their native blaster. Rest assured these darts will make appearances on our Youtube channel where possible. The Air Zone Shoot 'N Shatter System. The Shell Shock X-6 was previously available by itself, but I hadn't seen or heard enough of it to be interested. Chatter on the web suggests it was available back in 2009. The ranges are nothing to write home about, but the ejecting action along with the more realistic bullet casing are a plus for foam movie enthusiasts. We really like the feel of the blaster in our hands as well. It retails for around twenty dollars, now that it includes the Shoot 'N Shatter target system. It seems a little steep for the items that you get in the box, but electronics always give them an excuse. The un-boxing of the Shoot N Shatter. Though we aren't a mod-promoting channel or blog; Due to its poor range performance, the Shell Shock may be one of the most forward candidates for modification. The look and feel of the blaster is great and should have more power to come with it. 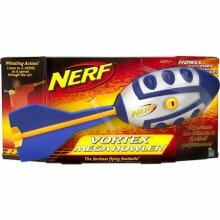 The Nerf or Nothing Blogspot notes that NERF streamline darts will fire when the post is removed from the shells and the dart is cut down. Yet I'd like to see something heavier, like a whistler dart, be able to fire from the Shell Shock. There were a couple of theories out there as to the new release. I know I saw the idea of discs a couple of times for sure, so props to you if you thought so! From the First Look there, it seems that they've effectively married their successful clip system endeavors with the novelty or intrigue provided by the Lanard disc shooters. I, for one, am rather excited to get a few in my hands and try them out. If the test video is any indication of the true stock performance, we've got a far-reaching beauty on the way. Yet questions are already being raised about the effectiveness of a foam disc as ammunition. One user on facebook said, " . . . won't the disc curve like crazy?" In fact, you can already see a 'disc>dart' and vice versa war starting on the page. The whole range versus accuracy idea reminds me of the old Koosh Vortex line that you can read a little about below. NERF calls the Vortex line the next evolution in blasters, though they're using on old school name. 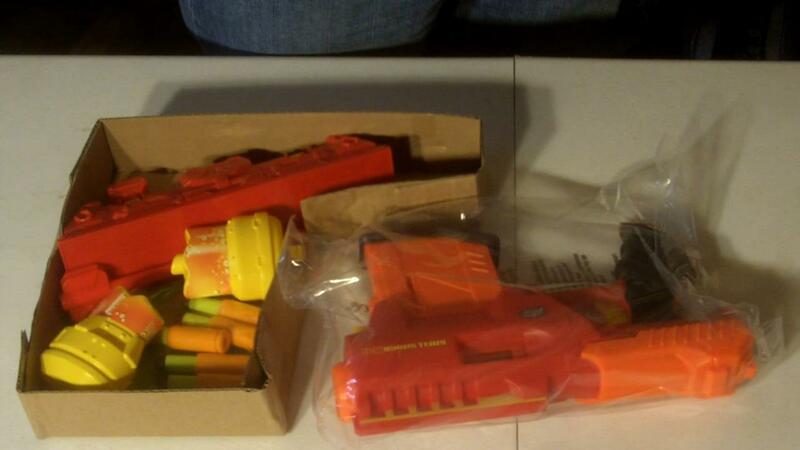 Koosh released their Vortex line of blasters in the late 1990s. Those blasters fired rubber rings instead of foam darts. While infamous for their indoor ranges, many jokes have been made about their outdoor short-comings. They weren't the most infamous series, but notablex and common enough to still be available at original cost or less on-line. And many of us slightly older NERF fans remember the Vortex Football that debuted in 1993 from the company Oddzon. It was a finned creation that let one throw the ball incredible distances with a lot less effort. A common nickname for the first release was the "Flying Lemon". Other versions like the "Pocket Vortex" and the screaming "Howler" also became fan favorites. Hasbro eventually acquired the rights to the toy -as they do with most successful such inventions. They of course branded it under NERF. Then there are the Lanard Fire Shot and Zip Shot disc shooters I mentioned above. They're still available in some markets today. I suppose that until September, they enjoy leadership in the foam disc shooting area. Though the name and the concept have been around, it looks like NERF will do what they are famous for. They'll take the ideas to the next level of production and show toy and foam fans everywhere what quality is like. From the little we know about it, Vortex looks like it can run as a sister line to N-Strike rather than a replacement which would be great news of both sides. Now all we can do is wait until 9.10.11 to get these beauties in our hands! Integrated Clip Systems -Dart Tag Only. 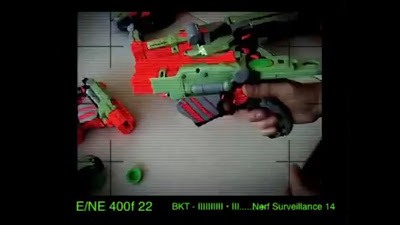 Just last week, foam warriors saw NERF's new Dart Tag line of blasters trickle into stores. After getting our hands on the new toys, we realized that there are a couple of big things that set apart this new series of blasters. The new tech found in the integrated clip is a great concept in and of itself. 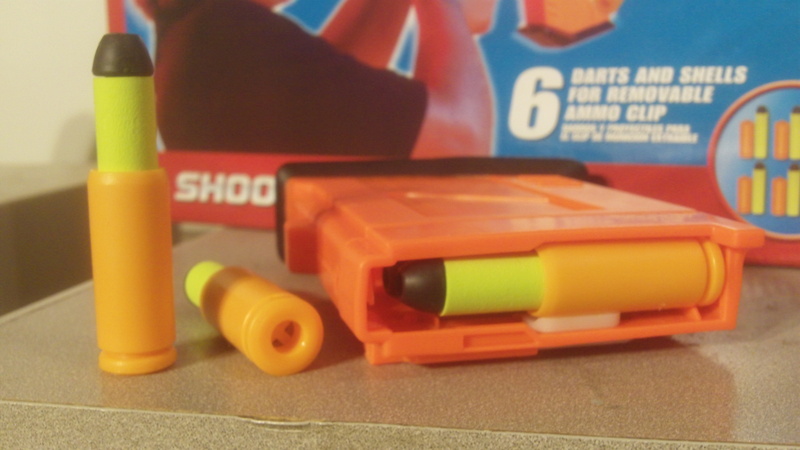 The inclusion of a self-contained clip that allows you to load multiple darts which are essentially ready to shoot is a step forward in the eyes of many NERF enthusiasts. This new approach eliminates two issues for the average user. For one, you no longer have to carry around extra clips to load which can be cumbersome and difficult to keep track of. Second, you get the convenience of not having to load a dart every time you fire your blaster. This is already a benefit to other clip system blasters, but many didn't consider that an advantage because of the loathed streamline darts. On another hand, not having clips to remove can be seen as a down side. Having preloaded clips that you can quickly replace is seemingly a quicker way to reload than manually replacing darts in the integrated clip during a battle. During the often short rounds of Dart Tag, this may be a non-issue. It'll be an interesting trade-0ff to observe whether versatile ammo in the integrated clip or a ready supply in the older clip systems win in longer term foam applications such as long-term battles or 'Humans versus Zombies'. Based on our own review of the NERF Dart Tag Speedload 6, the new integrated clip blasters should stay in the Dart Tag arena. They don't come with blaster accessories, tactical rails or even the eye gear that they recommend wearing at all times. They also don't come with any semi-convenient way to hold extra ammo. It seemed that NERF was on the right track last year when they released the ammo rail with the Barrel Break blaster. While we don't advocate mods, someone posted the idea to glue and velcro an ammo rail to the Quick 16 to allow for extra storage. Not a bad idea, but yet again spending more money just to get an adequate supply. 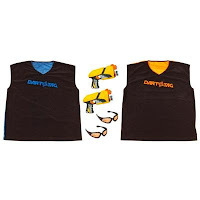 Overall, the line of Dart Tag Blasters look like they'll perform just as they are marketed to do. We can see how they'd likely operate well within the Dart Tag arenas that were seen in last year's Championships. Though, without serious modifications, they seem like they'll operate at a disadvantage in the rest of the realms a foam warrior would take them into.